Keep track of students with missing and/or incomplete homework with this daily homework log and tracker. Students will record each night's homework assignments on the homework log. There is even a place for parents to sign each day to verify they have checked their child's homework. Upon collection of each child's homework, the teacher will record missing assignments, missing parent signatures, missing written assignments on the log, and missing names on papers. 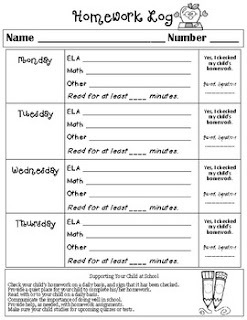 This is a simple and easy way to help children remember their homework assignments and to assist teachers in tracking them. You will need to print one page per day to track (record) students' homework and one page per week per student to record the homework assignments. Clip art is by Krista Wallden - Creative Clips. Fonts are by Hello Literacy.